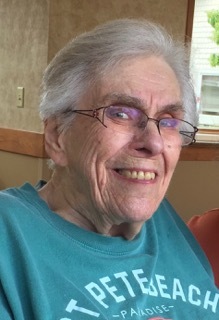 Janice Neville passed away at age 91 and 9 months on Sunday, December 2, 2018 at her Ridgestone Assisted Living residence in Elkhorn. She was born March 3, 1927 in Lake Geneva, WI to Frank and Lulu (Edmonds) Freitag and was baptized and confirmed at First Evangelical Lutheran, never having missed a day of Sunday school. She graduated with the class of 1945 from Lake Geneva High School. Janice worked as a bookkeeper for Schultz Bros. Dime Store in Lake Geneva until her marriage to Frederick Clausen in 1950. They moved to Elkhorn in the early 50’s where they owned and operated Clausen’s Villa Cafe and had two children. Jan later worked at The Elk Restaurant. In 1963 Janice and Donald Neville were married in Elkhorn. They had two children, and after Don’s death, (also on December 2) in 1979, Janice courageously faced life as a single parent. Survivors include her children James (Maxine) Clausen of Lake Geneva, LuAnn (Ellen Zander) Clausen of Cambridge,WI, Penny (Michael) Rasmussen of Elkhorn, and Kenny Neville of Sullivan, Indiana. Her grandchildren are James (Dawn) Clausen Jr. of Trinity, FL, Jonathon (Leigh) Clausen of Coram MT, Katelyn Rasmussen of Madison, and Megan Rasmussen of East Troy. Great grand-children are Natalie, Peerce, and Kaycee Clausen. Her god-daughter is Rebecca Smith Peterson. Janice was preceded in death by her parents, beloved brother Clarence “Bud” Freitag and brother Howard. The family extends sincere thanks to our mom’s caregivers at Ridgestone, and to Tori Windler Rollins who helped with personal care both before and after mom moved to Ridgestone. In years long passed, Jan babysat and cared for Tori which makes this a wonderful “circle of life” story. Our mom could have (but didn’t) write expert advice articles for home and family magazines with titles that would have included: “How to stretch a dollar and balance your checkbook to the penny into your 90’s,” “When’s the best time to break my block when playing Parcheesi?” “20 sites to see on a ride around Geneva Lake,” “Tips for survival while babysitting twin grand-daughters,” “Make Fluff salad your family’s favorite, and finally the one that could have (but didn’t) make her a millionaire, “How to listen to your kids and give non-judgmental advice and unconditional love.” Our mom was a wise woman of few words but a master of facial expressions. Visitation will be from 5-7 p.m. Thursday, December 6 at Derrick Funeral Home in Lake Geneva, The funeral will be at 11 a.m. Friday, December 7 at First Evangelical Lutheran Church, also in Lake Geneva, with Pastor Karl Schultz officiating. There will also be a short visitation prior to the service on Friday from 10:00am till the time of service at the church. Burial will be at Walworth Cemetery. In lieu of other expressions of sympathy the family has asked that you make a donation in Janice's name to First Evangelical Lutheran Church of Lake Geneva. Derrick Funeral Home is more than honored to be assisting Janice's family during their time of need.